I had this posted earlier but removed it. I thought we could post these projects when the catalog was released but I guess we can't post them until convention. Today is the first day of convention so here you go! I was fortunate enough to be asked to stamp for the convention display boards this year. 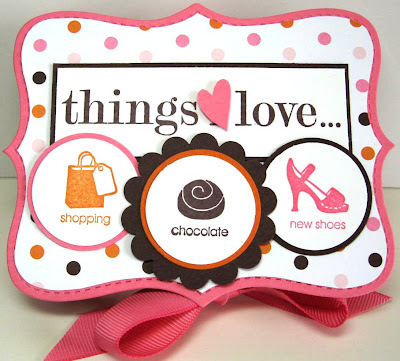 In the next few days I'll show you the samples I made for Stampin' Up! Today's projects use the new Things I Love stamp set. 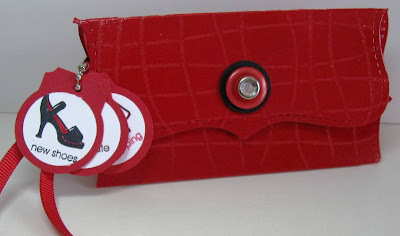 A clutch purse in Real Red with the faux alligator technique. This technique can be found here. Top Note die-cut box in Regal Rose. File folder style card in Soft Suede, Kraft, Naturals Ivory and Melon Mambo. Card in Regal Rose, Rose Red and Old Olive. 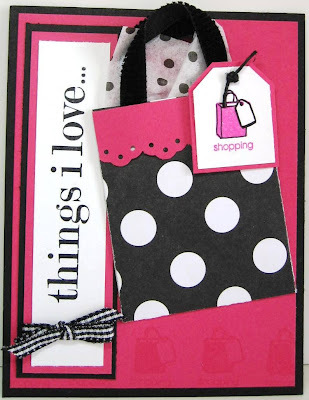 Shopping card in Melon Mambo. These are so adorable Becky. Thank You for demoing this set...I have had my eye on it but wasn't sure how I much use I would get from it but you have given me lots of great ideas. I was debating ordering this stamp set and you've just closed the deal for me. LOVE all your projects! Congrats on being asked to stamp for convention. What an honour! Wowza, all of your work is gorgeous and the little red clutch purse is adorable - TFS, love this set, and hope it will be in our UK catty! fat chance!! Hugs always! Fabulous projects Becky! Can't wait to see them in person at convention. Congratulations! What an honor!! Your projects are all lovely. Where do I find the faux alligator technique? I love you faux alligator clutch purse. Is there a tutorial for this technique somewhere? lovethese! how did you do the file folder card? lovely...looking forward to living vicariously through you at convention...wish I were there. I never wanted this set. Just didn't think it was something I would like. UNTIL NOW! I have got to have it! I went and added it to my wish list and actually put it in the #2 spot! It is versatile like you used it, plus I thought about using the stamps with a photo of my girls. I love the alligator technique too! Thanks so much! Becky that purse is the cutest! I can't quite work out the dimensions though...mine comes out looking more square as opposed to rectangular like yours...will you be posting a tutorial or dimensions for this project? Keep up the awesome work! My First Treat Cup Card and a Winner! A Massive Sea of Backpacks!